Based on available recent information, Smithfield has no reason to believe that the virus is in any way connected to its operations in Mexico. The company also noted that its joint ventures in Mexico routinely administer influenza virus vaccination to their swine herds and conduct monthly tests for the presence of swine influenza. The National Pork Producers Council reported today that according to the Centers for Disease Control and Prevention and the U.S. Department of Homeland Security, "people cannot get the hybrid influenza from eating pork or pork products" and "preliminary investigations have determined that none of the people infected with the hybrid flu had contact with hogs." However, Smithfield's statement fails to mention that countless residents of La Gloria were routinely and relentlessly exposed to airborne droplets of pig feces and decayed tissue for an undetermined number of years, thanks to toxic and sick-making clouds blowing outward from Granja Carrol's so-called "oxidation ponds"--or pig sewage lagoons. And that they have long complained of respiratory illnesses, well before their children started dying in March. Nor does the company's statement explain that contracting the H1N1 influenza virus does NOT necessarily require that one "have contact with hogs"; in fact, the flu virus is spread via tiny droplets of infected matter--feces, body fluids--that reach the mucous membranes and lungs when someone touches a contaminated surface before rubbing his eyes, for example, or when he unwittingly inhales the airborne, virus-containing waste droplets floating around his town courtesy of a nearby pig or poultry CAFO. 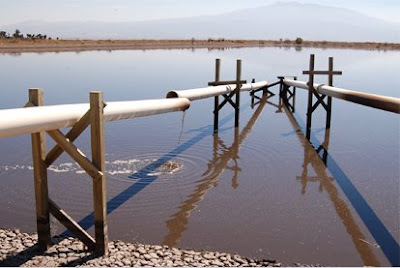 The infamous oxidation ponds, or pig-waste lagoons, filled with concentrated excrement, blood, and the rotting bodies of dead pigs; note the broken pipe. 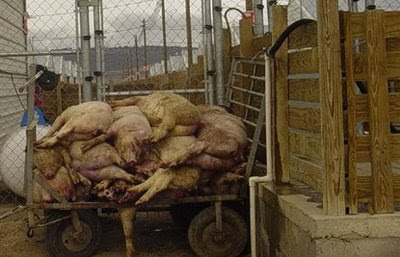 Dead pigs, stacked on a wheeled cart and left out in the heat. 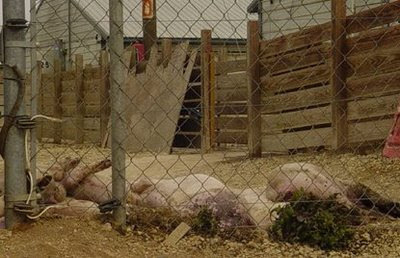 It is not clear if these animals' bodies were destined for processing or disposal. 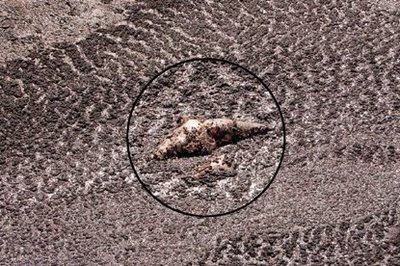 More dead pigs left out to rot; scavenger animals got hold of these carcasses. As the Enlace Veracruz writer notes, "This is the how Granjas Carrol cares for its dead." So, readers, are you horrified yet? And are you, too, wondering where on Earth the American mainstream media are?